this is something i wanted to do for years.Actually i have tried before, but was not satisfied with the results.But since then i have found much better sources.I would like to thank to 3 guys for this.First, Silkcut for his vinyl rip of "The Toronto Session", than Midnrambler for posting on HC "Keith Richards 1981 & 1983" and in the end Erik Snow for his post of VGP-377 "Keith Richards - A Stone Alone". My remastering was just some EQ and level correction.After years of remastering bootlegs my philosophy is less is more, what i am trying to say is that most of the bootleg remasters suffer from being over-done.It looks like people are just drawn to do something,just because they can.There was no noise reduction or compression used on this one,no brick-wall! Another fantastic artwork was done by Mr.D. 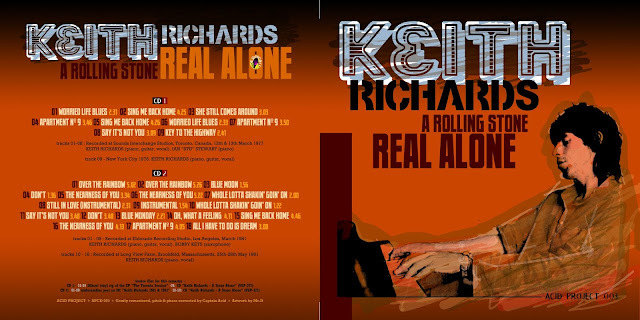 CD 01 ( 1-8 ) - Silkcut vinyl rip of the EP "The Toronto Session" ; CD 01 ( 9 ) - VGP-377 "Keith Richards - A Stone Alone"
CD 02 ( 1-9 ) - midnrambler post on HC "Keith Richards 1981 & 1983" ; CD 02 ( 10-18 ) - VGP-377 "Keith Richards - A Stone Alone"